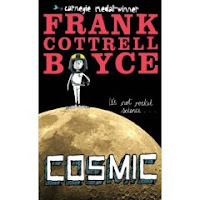 Frank Cottrell Boyce has done the impossible: He's made me read a book that involves space travel. * Yeah, I'll admit it. I'm one of those readers who will not read books that involve spacesuits, space vehicles of any kind, and weightlessness--fiction or non fiction. All those details about Mach this and Light Year that make me, well, space out. When Florida and Liam arrive to China, they find they are one of four father-child teams. Liam takes to his role as "Dad" with great success, especially when matched against the other competitive father-son teams. One Dad and his kid are all about making money, another pair is all about success (Dad writes self-help books about overcoming fear and being successful), and the third pair is comprised of father-son math geniuses. Compared to his competition, Liam is an ordinary Dad--nothing special, really--but his eleven-year-old sense of fun and his true compassion for all the kids, not just Florida, sets him above his middle-aged pack. While Cosmic does involve a trip around and to the moon, in the end it's about being a kid who has to grow up too fast. Liam is forced into adulthood because of his size, but his space-traveling peers have grown up too quickly because of their success-oriented parents. A good Dad, like Liam's own--who is home in Liverpool thinking his son is on a trip to the Lake District--and what Liam himself becomes on the space trip, allows his kids to grow up at their own pace and to have a little fun along the way. I listened to Cosmic via an audible download because I could not wait for its July 30th release in the States. While the audiobook is fantastic, I wish I had the paper copy to quote from: There are so many funny and bittersweet lines on growing up and on being a dad in Cosmic. Still, narrator Daniel Ryan does a bang-up job bringing Liam and Cosmic to life. If you have a long roadtrip ahead of you, this audiobook is highly recommended for all children (and their parents) ages eight and up. As Liam would say--this book is cosmic! * Other than Frank Cottrell Boyce, only Ian McEwan, Kate Atkinson, and Philip Pullman could get me to read a book about space. + I'm sure there is a better description than "cellphone shenanigans," but, again, as much as I love technology, I sure hate to read about it. Monica Edinger posted her review of Cosmic today too! You can find it here at educating alice.